We had already gone to the Monza race track in 2015 for the 1000 Miglia but, for the first time I was there to see a contemporary automobile race, the Monster Energy Monza Rally Show which uses sections of the Formula 1 circuit and the old high speed ring. It was different. It was fun, although it has not been all the way straightforward or painless. Samsung’s step-counter has measured 12 km walking in a single day. La coppia Marco Bianchini-Silvio Stefanelli su Lancia Rally 037, vincitori tra le auto storiche. Cristina had arranged everything with the press office. There are four level of access for photographers. A simple pass (access to the tribunes and to the paddock); a yellow security vest (AOTA plus certain spots on the race track); an orange vest (AOTA plus complete access to the track view points); the Monster pass (AOTA plus access to the Monster welcome areas and Monster press conferences). Monster Energy is the sponsor of the show and demands full control of all communications. An impossible task, that poses lots of restrictions and constraints. 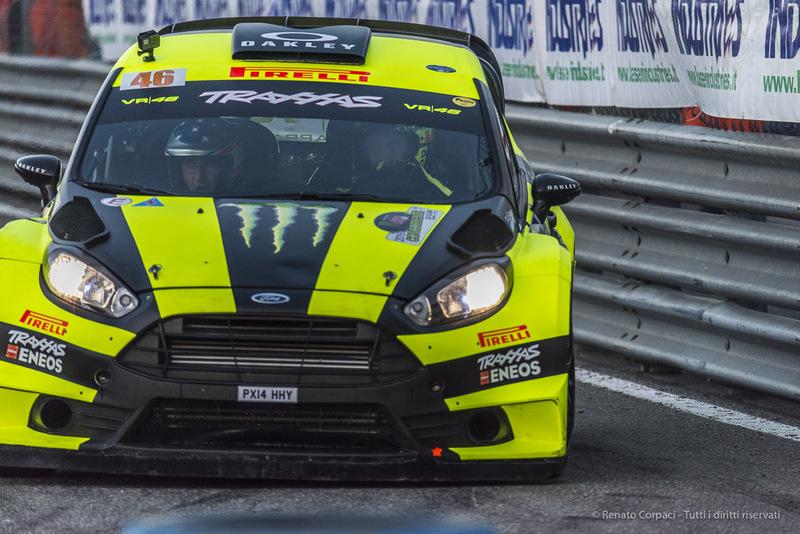 Main Monster Energy drink sponsored star is Valentino Rossi, about to become the fifth time winner of the Monster Energy Monza Rally Show. His press office required a fifth degree of access. Forget it. We managed with a single yellow vest in two. It was not easy, but we managed.